Choosing the right vendors for your wedding can be an overwhelming task. This is especially true when choosing a photographer. The images that your photographer captures are going to be the official visual documentation of your wedding. Those photos are the one thing that you’ll look back on over the years to remember your wedding, so you want to be sure that they capture the true essence and feel of the day! The answer you want is “YES.” Professionals carry insurance. Many wedding venues require that your photographer provides proof of at least $1 million dollars of insurance coverage. What if someone were to get injured? What if an expensive item at the venue is damaged? Insurance protects everyone from what could be an ugly situation. Do you carry backup equipment?/Do you have a backup plan in the case of an emergency? If your photographer drops the camera and it becomes damaged, he/she will no longer be able to finish photographing your day without a backup camera, lens etc. What happens if it rains on your wedding day? What if your photographer is too sick to work? Knowing the answers to these questions ahead of time is vital to ensuring your wedding day goes off without a hitch. A photographer’s portfolio and social media stream is often times a highlight reel of their very best images. Viewing an entire gallery (or multiple galleries) can give you a better idea of what to expect. Not every photo may be as dramatic or glamorous as the bride and groom portraits- this is not uncommon, but having the right expectations set ahead of time can help you avoid miscommunication and disappointment. No one wants to think it will happen to them, but it’s true, sometimes weddings have to be canceled or postponed. If that were to be the case, what happens to your retainer? Will the photographer be willing to reschedule for your new date? It’s important that you know the answer to this before you commit. Just in case. What exactly is included in the package I’m considering? What is NOT included? Collections, products, and services can vary greatly from photographer to photographer, so comparing two price sheets is not always the best way to judge which photographer is better for your needs. Ask questions and take the time to meet with each prospective photographer in order to get a feel for their level of service, quality of products and so on. Do you have an overtime policy or fee? Some photographers will not work more than a certain amount of hours. Others have an overtime fee associated with their services. Find this out ahead of time. You never know if you’ll need an extra hour of unexpected coverage. What’s your policy for backing up/storing my photos? How long do you keep them? Make sure you understand how long your photos are protected so that if you have to come back for reprints, or if your files become corrupted, you know what to expect and there’s no devastating disappointment. Having a second photographer available can be an invaluable asset to your wedding photography coverage. The second photographer can cover alternate angles or different parts of the day that the lead photographer is unable to photograph. For example, the second photographer can cover cocktail hour while your lead is taking your bride and groom portraits. Most of all, having a second photographer is kind of like having insurance. An unknowing guest may step out in front of your photographer during a key moment causing them to miss the shot, or equipment could fail. Having a second photographer is a great way to ensure that nothing important gets missed. Want more tips like this? Click here to have it delivered directly to your inbox! This is a great informative post for your bride to be! Great work! 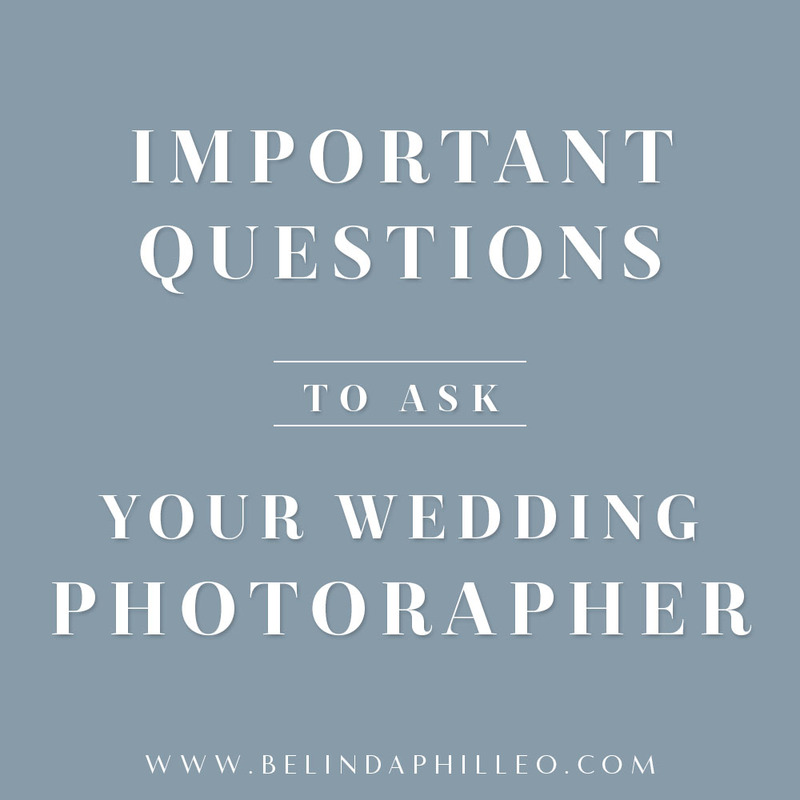 Thanks for these important questions to ask a photographer. My cousin is getting married here soon, and I think she really cares about how well the wedding is photographed. I like your question about seeing a gallery, the thing about photography is that there is physical evidence of how good they are. I like these tips, thanks for the help!